With CK Isotopes Ltd’s high reputation within the speciality gas and gas handling equipment markets, we are able to use this background to offer the highest levels of quality, service and knowledge when supplying stable isotope gases. 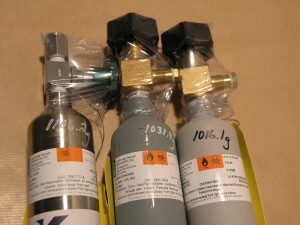 Our product offering allows us to supply stable isotope labeled gases with a wide variety of packaging options and handling solutions to enable connection to any type of receiver. Many stable isotope gases are kept in stock within the UK and can be delivered within 3 working days on our standard delivery service. If you require same day service to ensure your lab never runs out at a critical moment please do not hesitate to ask. We also prepare custom calibration standard mixtures to exact specification by utilising our state of the art filling technology coupled to GC-MS/MS live analysis to produce delta values within +/- 3ppm depending on mixture components (PPB possible with larger volumes).